Promotes healthy cartilage to encourage joint comfort. 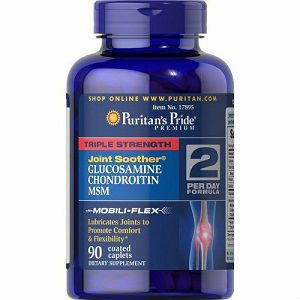 Puritan’s Pride Triple Strength Glucosamine, Chondroitin contains Glucosamine, Chondroitin, and MSM, which work together to enhance overall benefits in the body. Mobile Flex – Proprietary Blend Methylsulfonylmethane (MSM), Chondroitin Sulfate,Collagen (Hydrolyzed Gelatin), Citrus Bioflavonoid Complex(Citrus spp.) (fruit and peel), Boswellia serrata (resin) – 1194 mg.
2 capsules daily with a meal. $7.83 for a 90 tablet bottle. Also available for $23.49 for 3 bottles and $46.98 for 6 bottles. Free shipping is available for buyers who order and reorder every 3 months. The product vendor offers a money back guarantee and provides a customer service number on their website. According to the product source, all a customer has to do is return the unused product for a refund. Customer reviews found on the product source website were favorable. In fact the product source allowed readers to read all 243 reviews for this product on their website. The product vendor also offers a money back guarantee as well as 24 hour a day 7 day a week customer service. Given this and the low product price this product may be worth a try for purchasers looking for a joint strengthening product. Mark Stevens	reviewed Puritan's Pride	on August 9th	 and gave it a rating of 3.